Saturday 6th June has been classified as ‘National Gin Day’ on social media. This has prompted PFR to take a look at the UK gin marketplace and suggest some easy ways for pub, bar and restaurant operators to capitalise on the trend. The huge success of gin is a recent phenomenon, with craft gin distillers and premium gin brands driving a massive trend, especially amongst younger people who previously considered it an old fashioned tipple. As a result, gin is now the most popular spirit in the UK, with 29% of voters voting it their favourite in 2017 – up from third place in 2016 (YouGov). More than 47 million bottles of gin were purchased in 2017, and gin sales doubled in value over six years, reaching £1.2bn in the 12 months to end of September 2017 (Wine and Spirit Trade Association). In order to capitalise on the Gin Boom, pubs and cocktail bars should offer a range of craft and premium gins, with one or two local distilleries represented. Assorted flavoured tonic waters should be stocked, with elderflower and aromatic blends being popular.  As gin drinking is now experiential, providing a fully rounded offering helps to maximise customer delight as well as provide additional income streams for operators. Pubs can now get in on the gin cocktail action by purchasing an affordable starter kit from Barfly by Mercer, which provides bartenders with everything they need to be amateur mixologists. Offering tapas or sushi with gin encourages drinking customers to stay longer, without the need to splash out on a full meal. Small plates are a key eating trend for 2018, so combining gin with tapas or sushi will tick all the boxes for casual dining at pubs and bars without a chef. Tapas served on a Revol Porcelaine Basalt platter. The Basalt collection is made from porcelain that mimics slate, and is resilient, non-porous and dishwasher safe. Sashimi salmon on a Mealplak platter. Mealplak tableware is made from a unique, patented resin which is guaranteed against colour fade and breakage for 10 years. Ideal for outdoor casual dining, Mealplak dishes can be frozen to keep cold dishes cold! Traditionally wines are served with fine dining courses. With the huge range of gin flavours and mixes to choose from, why not experiment by offering a flight of gin? A gin tasting menu can be created using complementary ingredients. Seafood and salmon are especially good with gin, and oysters can be enhanced with a few drops of gin and tonic. In fact, one enterprising Belgian chef has actually produced a lobster gin, made by soaking a raw lobster in pure alcohol for two days, binning the lobster (what a waste!) and mixing the liquor with gin. Other ingredients that play well with gin include spicy or curried lamb, cured meats and strong and blue cheeses. Fresh fruity desserts and sorbets with citrus and berry flavours are especially enhanced by a carefully chosen gin. 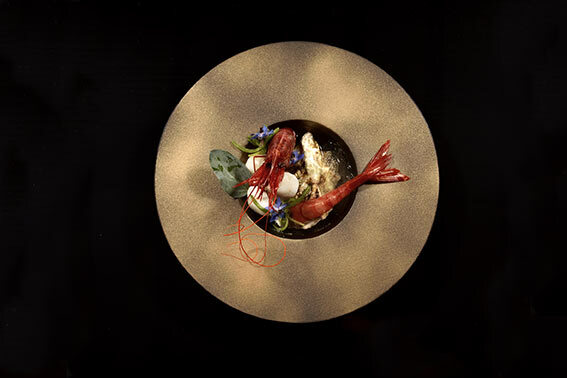 The Sphere collection by Revol Porcelaine elevates seafood dishes. Revol’s fine porcelain is hand sprayed with real gold. Serve a gin with gold flecks for a glittering presentation! As dining and drinking move outdoors, we have brought together some of our light equipment favourites to help operators and chefs to match their presentation with 2018 summer trends. This year natural materials and organic shapes are favoured, with monotone neutrals, pastels and vibrant brights. Non-alcoholic retail concepts such as Redemption Bar and Sober Parrot are emerging, with health, nature and simplicity key themes. Veganism and wild foraged ingredients are becoming more mainstream as consumers focus on achieving a balanced lifestyle. However, often the practical aspects of serving outside in the hospitality industry mean that safety and longevity are essential, especially for larger operations. With consumer preferences moving away from disposables, robust reusable polycarbonate and resin items cater for restaurant, hotel, pub and bar operators who are keen to reduce environmental impact and financial waste. These products are also ideal for contract caterers servicing outdoor events, providing safe, green and economical alternatives to glass and crockery. Our light equipment brands are manufactured by some of the most respected companies in the industry, and their design teams work closely with chefs to develop new collections throughout the year which reflect the zeitgeist. With a vast range of products, and new innovations emerging almost daily, American Metalcraft leads the way in trend setting for the hospitality industry. 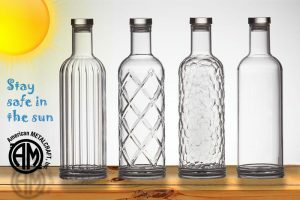 There are many products that fit the summer outdoor dining brief, and we feel that these unique clear polycarbonate water bottles provide the perfect solution for delivering water and juices outdoors without the risk of breakages. 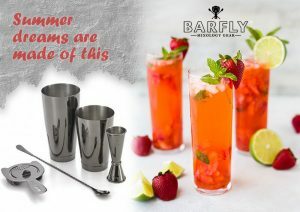 Created last year by Mercer Culinary, the Barfly mixology range is for the professional with an unwavering commitment to the art of the cocktail. These barware essentials and accessories are designed to deliver optimal appearance, temperature, consistency and proportion in every glass–with masterful results. 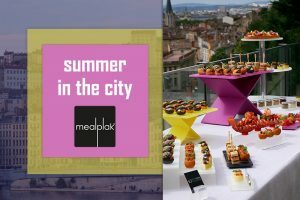 Mealplak offers innovative and functional table and buffet wares designed to withstand the rigours of the restaurant trade. Products are made from Nacryl© , an exclusive, renowned, high quality material, attractive and easy to use. Food friendly and non-porous, Mealplak products are enjoyed for their bright colours, subtle translucent appearance and silky touch. 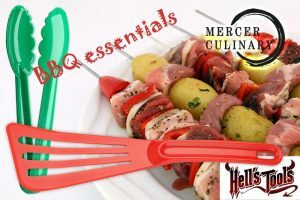 Hell’s Tools from Mercer Culinary are a range of utensils constructed from specially formulated nylon to stand up to high-temperature applications. A large variety of styles, sizes, and colours are offered to meet all your culinary needs. Ideal for barbecue and grill use, Hell’s Tools are are stain and odour resistant, and incredibly durable. Combining a natural organic feel with tactile surfaces, Revol Porcelaine‘s hand finished products are designed to display food with artistry. Celebrating their 250 year anniversary, Revol’s enduring appeal to globally renowned chefs is testament to the outstanding quality of their products. With a number of collections ideal for summer dining, selecting just three for this article was quite a challenge! Arborescence channels the forest with its tactile bark finish. Available in muted grey tones as well as white, Arborescense brings nature to the plate. Natural slate has had some bad press recently due to hygiene concerns. Revol has the perfect solution with its Basalt collection; hard wearing, non-porous porcelain that looks just like slate but with all the benefits of culinary porcelain. 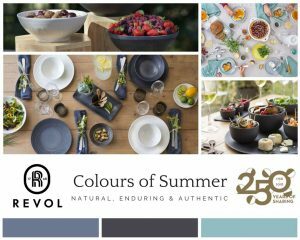 With authentic shapes and a great colour range, Color Lab table ware is made by hand and then stamped with REVOL’s quality seal. Each porcelain tile is delicately submerged in a bath of enamel, and the natural pigments will reveal their splendor during firing. We share inspiration for making your drinks and cocktail parties the talk of the town, with a wide range of innovative bar products from American Metalcraft Inc., Barfly by Mercer and Revol Porcelaine. Barfly Mixology Gear by Mercer is for the professional with an unwavering commitment to the art of the cocktail. These bar ware essentials and accessories are designed to deliver optimal appearance, temperature, consistency and proportion in every glass–with masterful results. Tools make the taste. We invite you to browse Mercer’s full line of mixology gear to see how Mercer raises the bar.